The smaller part of an old village house which has been undergoing steady refurbishment in recent years, Aglaia studio is a one-bedroom apartment in a superb hillside position just a minute's walk from the village of Loggos and two minutes from the nearest beach. The studio is self-contained and offers neatly arranged and completely private accommodation for couples or singles. Inside there is a double bedroom, kitchenette/dining room and separate bathroom, while outside the quiet, secluded patio is just a few steps from the house. A great favourite over the years for those seeking a quiet little hideaway in the most convenient location possible. The upper floor of the house is divided into two parts, a two-bedroom apartment (the Villa) and a one-bedroom apartment (the studio). 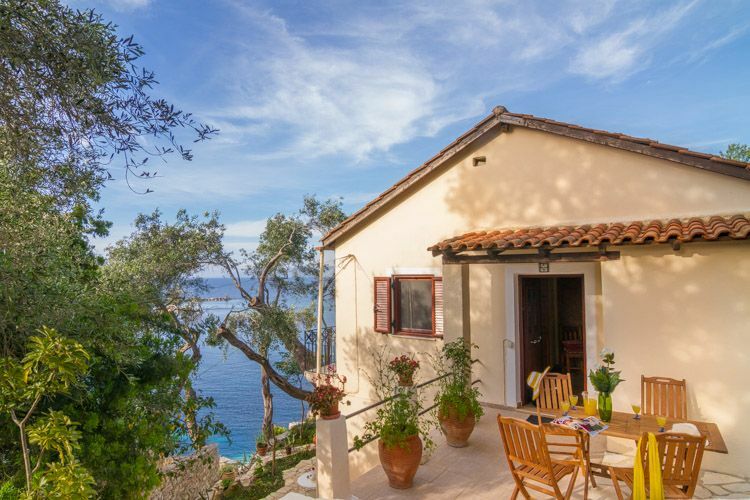 Both are reached by a steep flight of steps (75 in all) from the road and each has its own entrance and private terrace enjoying commanding views of Loggos bay and the sea beyond. Lovely apartment overlooking the village harbour, up in the trees so you feel like you’re in a treehouse- private but you can see the few boats ominous and going below. The sea lapping at the harbour shore lulls you to sleep. Perfect holiday, weather, swimming, boating, fresh fish.